Joel Bergner painted the Holywell Lane wall for Street Child United as part of their global summit. The UK based NGO promotes the rights of street children around the world. Bergner has worked with the organisation previously including in a refugee camp in Syria and as part of the Street Child World cup. 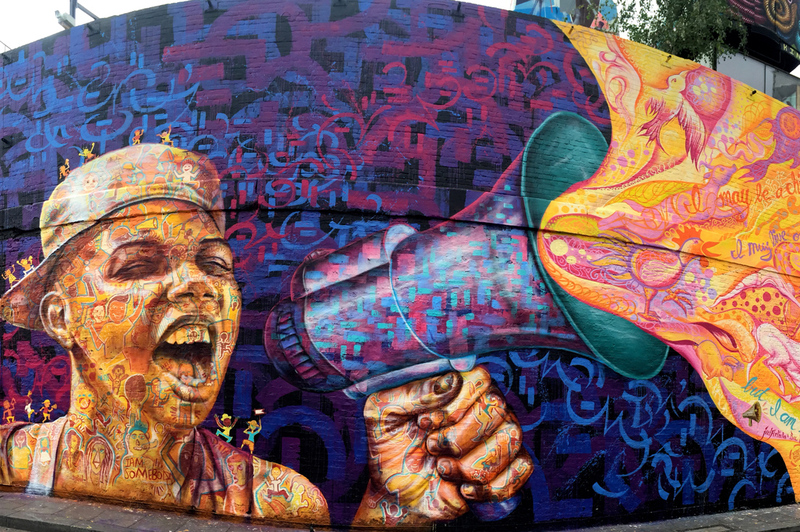 The mural features a young woman shouting “I am somebody” through the megaphone. The model is Jessica who grew up in a favela in Brazil and is now a Street Child United ambassador. Other ambassadors also helped add the child-like pictures within the artwork. Bergner explained that the smaller megaphone in the piece is also a chance to interact with the piece and to amplify the message. People are encouraged to take pictures with the hashtag #Iamsomebody. A full interview with Bergner is now on this site.